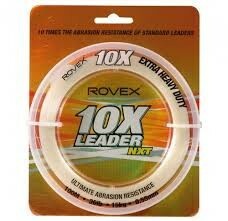 Rovex extra heavy duty leader 100m Rovex 10X Mono Leader is made using the latest advanced polymer bonding technology to create a premium-quality heavy-duty monofilament nylon leader that offers up to 10 times the abrasion resistance of most other mono leaders of the same diameter. The 10X Mono Leader formula is as tough as a quality nylon leader gets and will be first choice for serious saltwater anglers targeting everything from flathead to barramundi, to samson fish, giant trevally or kingfish, to tuna or billfish. FREE Delivery on all Rovex Shock Leader/Rig Body/Hook Length over £100!! !